The Mt. St. Joe wrestling team (No. 1 in the latest Maryland state rankings) won the MIAA tournament title last weekend by 89 points over No. 2 McDonogh, while placing all their wrestlers third or better. The chances of that feat being replicated at the state tournament were not great. After all, with the introduction of the Washington D.C. area teams, and squads from other reaches of the state, the extra competition would normalize the Gaels’ output, right? Well, it turns out…no. As St. Joe terrorized the two-day competition at the APGFCU on the campus of Harford Community College to the tune of 353 points. Good enough for a mind boggling 108.5-point margin of victory over McDonogh. And once again, all 14 grapplers earned nothing worse than bronze. The Maryland Independent Schools state tournament was St. Joe’s playground this weekend. “We still have some things to work on, however, overall, I felt the teamed wrestled sharp,” Gaels coach Harry Barnabae said. “Our goal coming into the MIS was to qualify the entire team for the National Preps. Thankfully, we had strong performances from Couch, Wright, Woods, Stern, Roybal, and Warner who battled back against some very tough opponents to finish third. 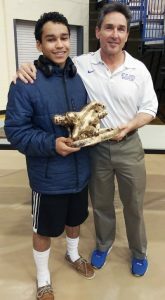 St. Joe’s Chris Barnabae is presented with the MIS Outstanding Wrestler award by his father and coach, Harry Barnabae. St. Joe’s four champs tied No. 11 St. Paul’s for the tournament high, and their first gold was captured by Barnabae’s son, Chris (No. 1 at 120). 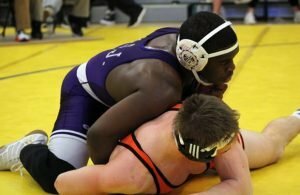 Barnabae, who is also ranked 11th in the nation by FloWrestling, ran up a tech-fall over No. 4 Shawn Strand of Loyola in the finals. 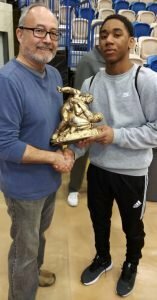 That impressive showing coupled with four first-period pins put a nice bow on Barnabae’s first state title as he was also named the Outstanding Wrestler of the event. Joining Barnabae as first-time champions were No. 2 Zach Phillips and No. 2 Isaac Righter. Phillips captured his 160lb title with a commanding 8-3 decision of No. 3 Dylan Blau of St. Paul’s. Letting things go to waste is not Righter’s forte, specifically time. The junior, who is No. 9 in Flo’s rankings, wasted little time on the mat, planting all four of his foes in the first period, two in 30 seconds or less. In the finals, Righter decked McDonogh’s Cody Williams (No. 8), 1:27. No. 1 Justin Henry clinched his second consecutive state crown with a 9-1 major-decision against No. 4 Jackson Bonitz of McDonogh. The senior has been around long enough to know what it feels like for the team to come up short at the state tournament. As a freshman Henry saw the Gaels finish third, and now closes his career with his team winning three titles. Bringing home state silver for St. Joe were, Nathan Porter (126), Matthew Jun (138), Connor Strong (145) and Jonathan Short (145). The bronze medalists were Joe Couch (106), Jacob Wright (113), Clement Woods (132), Chris Roybal (152), Ethan Stern (195), and Parker Warner (220). Former Mount St. Joseph coach Allen Smith presents the trophy for most falls in the least amount of time to the Gaels’ Clement Woods. No. 6 Woods’ third-place showing provided a bit of instant retribution. His 10-5 win over No. 9 Alex Figueiras (St. Mary’s-Ryken) avenged Friday night’s quarterfinal loss, 10-4. Woods was also awarded the trophy for most falls (five) in the least amount of time. McDonogh equaled St. Joe with eight finalists, coming away with three champions, No. 2 Ray Kable (132), No. 2 Dominic Solis (170), and No. 1 Garrett Kappes (220). Solis won his second title in a row, both over St. Joe’s Short, 6-0 last year, 7-2 this year. The MIS tournament has been Kable’s Achilles Heel during his time in the Eagle orange. Three times previously, Kable strolled in fresh off an MIAA title, only to suffer a loss in the state finals. After capturing MIAA title number four last weekend, Kable was determined to write a different ending to his story and claim that elusive state crown. He had to work overtime for it, but the gold would hang from his neck after a 2-1 win over Archbishop Spalding’s No. 5 Joe Fisk. Another first-timer was Kappes, who downed Georgetown Prep’s Kyonte Hamilton (No. 3), 9-3, in an impressive showing. Despite owning a previous win over Hamilton and being a double All-American at Fargo, Kappes was getting no love from FloWrestling who have Hamilton at No. 14 in the country based on his showing at the Beast of the East. Those rankings also ignore Hamilton’s loss to Western Tech’s Ike Kalu (No. 2) in the PIT finals. Kappes’ solid win should earn him the proper national notoriety he deserves. The Eagles that landed on the second rung of the podium were, Cooper Flynn (113), Harrison Trahan (152), Bonitz, Jack Wimmer (195) and Williams. Sean M. Scott was third at 138 and Aidan Hurdle placed eighth at 160. No. 7 Spalding’s third place showing (208.5 points) was powered by three champions, No. 2 PJ Truntich (126), No. 3 Rick Couch (138) and No. 3 Garrett Fisk (152). Truntich and Fisk avenged losses in winning their titles, while Couch cruised to victory, and his first state crown, with a 6-0 blanking of St. Joe’s Jun (No. 6). Fisk finished a disappointing third at the MIAA tournament after a tough semifinal loss to McDonogh’s Trahan (No. 2). The senior got revenge on the Gaels’ Roybal (No. 6) in the semis here with a 7-1 win after being pinned in their dual meet. Following Roybal, Trahan awaited, and Fisk was ready, using a couple of big moves to post a 7-3 decision, and with it, his first state crown. Spalding’s PJ Truntich (left) shook off three consecutive losses to MSJ’s top-ranked Nathan Porter and win the 126 MIS crown. Truntich had the tallest order of all the Cavalier finalists. The defending state champion stood opposite of No. 1 Porter, who had beaten him the previous three weekends (Ocean Lakes Invitational, dual meet, and MIAA tournament). 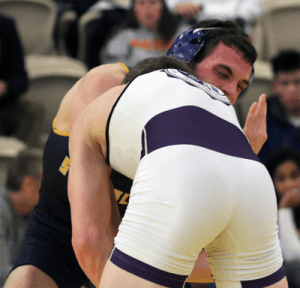 The odds were stacked against Truntich, but much like last year with his pin over three-time state champ King Sandoval in the finals, the senior came up big when it mattered the most, shocking the Gael with a 6-4 win for back-to-back championships. In addition to Brady Pruett’s and Joe Fisk’s silver, Drew Baublitz (120) was fourth, Nick Paolucci (145) and Dustin Radford (195) were fifth, and Dylan Lewis made it to the seventh spot at 160 for Spalding. St. Paul’s 196 points and fourth-place showing were built on the back of its four champions, No. 1 Nasir Wilkinson (106), No. 2 Wil Guida (113), No. 2 Max Hammond (145), and No. 2 Jack Parr (182). If you think Truntich had a mountain to climb, check out Guida’s challenge. He was riding a four-match losing streak to Cooper Flynn (No. 1 and ranked 10th nationally by Flo) when he toed the line in his title bout. Guida did have two wins in his pocket from his first two encounters with Flynn, so victory was certainly possible. That possibility became a reality when Guida came out ahead of his rival, 3-1, for his first trip to the top of the state podium. Wilkinson and Parr had relatively easy rides to victory posting 8-1 and 7-2 decisions respectively. Wilkinson took out Spalding’s Pruett for the second week in a row, and third time this year. Parr needed overtime last week to defeat McDonogh’s No. 3 Wimmer. The three-time state champion made some adjustments in his approach for this match and it paid off big-time, closing the book on the local chapter of his career in style. Parr was very pleased with title number three but hopes to take care of unfinished business next weekend at the National Prep tournament. “I’ve been on that stage before and knew I could win,” Parr elaborated. “It just felt good to actually secure it. I still have one more week left and what I’m really looking forward to is National Preps next week. I’ve never won that before and I’ve been really close every year, so that’s what I’m really shooting for right now. States was good but nationals is gonna be better. 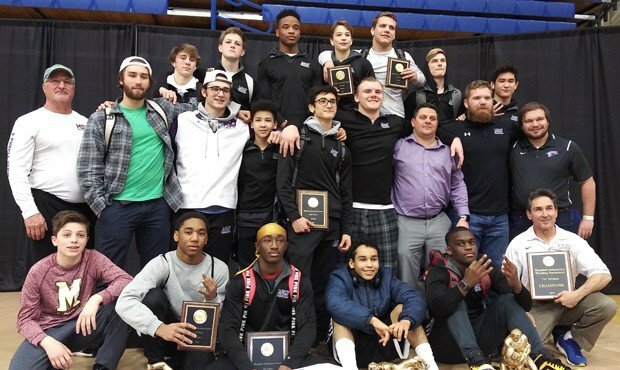 Max Hammond of St. Paul’s (dark singlet), one year removed from a public schools state title at Sparrows Point, won a private school crown on Saturday with a win over St. Joe’s Connor Strong at the MIS. Hammond won a 2A/1A public schools state championship with Sparrows Point as a sophomore. The junior made the move to St. Paul’s last year to up the challenge. Hammond took his lumps, but seemingly improved every time he stepped on the mat. That improvement shined through in the finals as he picked off the state’s top-ranked 145lber, Connor Strong, 3-1. Strong beat Hammond 2-1 in the MIAA finals a week ago. Loyola, who is tied for 7th with Spalding in the state rankings, rounded out the top five with 192 points. The Dons had one lone finalist in Strand. The senior avenged a loss to No. 3 Evan Eldridge (St. Mary’s-Ryken) from Mount Mat Madness with a 11-8 win in the semifinals. Curley was the next highest placing local team, landing in the 10th spot with 97 points. Coach Barnabae reflected on his team knocking down another of its goals for the season and continuing the rich wrestling history of St. Joe. “Throughout the season, we discuss team goals, and focus on the fact that this year’s wrestlers are creating their own legacy. They want to get their picture or name on the Wall of Champions. It’s not just about the 14 starters, it’s about all the wrestlers in the room pushing one another to get to the next level. Wrestlers such as (Lucas) Ognissanti, (Frankie) Antonelli, Bradley David, (Brandon) Stalnaker, and (Ashton) Knight just to name a few. In a strange twist that hasn’t happened in several years, if ever, all 14 champions are from the Baltimore Metro Area, and all came from the top four teams in the standings. In fact, all but one (Kyonte Hamilton) of the 28 finalists were from MIAA schools. 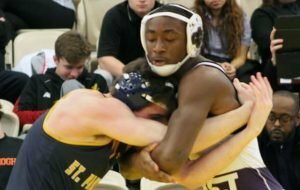 Outstanding Wrestler Chris Barnabae (left) dominated Loyola’s Shawn Strand during his tech fall in the 120 final. McDonogh’s Ray Kable claimed his first MIS title on his final opportunity, defeating St. Joe’s Joe Fisk at 132. St. Joe’s Zach Phillips (right) knocked off third-ranked Dylan Blau of St. Paul’s, 8-3, to win the 160lbs championship. Top-ranked Justin Henry (top) of St. Joe clinched his second consecutive state crown with a 9-1 major-decision against No. 4 Jackson Bonitz of McDonogh. St. Joe’s Isaac Wright (top) sinks in a half nelson on his way to a first period pin of McDonogh’s Cody Williams in the 285 final.